Throughout the years in the anti-counterfeiting business there have been a few times where we, and our clients, have lauded our victories when a raid was accomplished on a factory making Chinese knockoffs. Once, I remember, back in 2006 our client’s attorney actually saw thirteen people in handcuffs. Chinese nationals, in China. In cuffs for making fakes. Not bad for a case that started with some handbags sold by a Purse Queen in Missouri! Every time I tell that story, I finish it with the punchline that “I’m sure the cuffs came right off when my client boarded the plane.” I’m not faulting China and that really isn’t my point here. But the disconnect between cultures is. There is obviously a totally different meaning of ‘authenticity’ when you cross oceans. You may recall the incident during the opening ceremony of the 2008 Beijing Summer Olympic Games when the seven year-old vocalist who was commissioned to sing ‘Ode to the Motherland’ was replaced by a prettier lip synching faker. A recent Slate article reports on a whole new kind of counterfeiting: fake prisoners. No kidding, guys. People who are facing jail time in China can hire a less-fortunate guy to confess, or just replace him in the can. This brings me to a whole new thought on the counterfeit enforcement business. While diplomacy with China is important in the fight against counterfeit goods, raiding their factories and jailing their owners is probably not effective. The most important facet of my solution is to curtail the demand in the United States and other countries with a massive consumer base. The way to do that is to enforce against all sellers of this product in those countries. Contrary to the spirit voice in Field of Dreams, wise businessmen will tell you that supply does not dictate demand. Stop promising your client you’re gonna get the “big factory” and focus on stopping the mid-level distributors here. I promise your performance numbers will increase and, most important, you will help restore value and dignity to the client’s brand. I know from great experience that many people who became huge sellers of counterfeit goods here in the United States would have stopped if they had just worn a pair of handcuffs early on. One night in jail works wonders on the soul. Enforcing the smaller crimes is part of the plan that makes many of our inner cities safer. Curtailing vandalism in your neighborhood leads to less violence down the line. In tough economic times it is easy to cut costs and focus on the biggest problems. The problem with the latter is that no big problem started that way. My suggestion to my readers is to simply place most of your efforts on the cities and countries with the highest retail sales of genuine product. I’m not talking about the people selling fakes at swap meets or in the bad neighborhoods. I’m speaking of the mid-level distributors who are getting their product directly from China and supplying those folks. As I regularly search for shows on my TiVo using keywords that relate to my interests and work, I ran across a rerun of ‘Swift Justice with Nancy Grace‘ that originally aired on 2/28/11 entitled “An online rip-off; pit bull puppies”. This was caught in my filter because the word ‘knockoff’ was in the show’s description. In this episode, the first case was of a woman who had purchased a pair of Coach boots from a website buymerchant.com. Upon receipt of the boots, the Plaintiff stated that she believed they were counterfeit and was entitled to a refund of $174 USD. Whether the goods in this case were actually counterfeit is actually not even relevant to what I’m about to share. What followed was some of the most irresponsible judiciary-slash-journalistic behavior I have ever seen. While much of the civilized world is trying to discourage this type of contraband activity, we have a nitwit like this adjudicating cases with her own television show, and doling out legal advice on CNN. While Nancy Grace is hosting ‘Swift Justice’, what she really needs is a swift kick in the rear end. 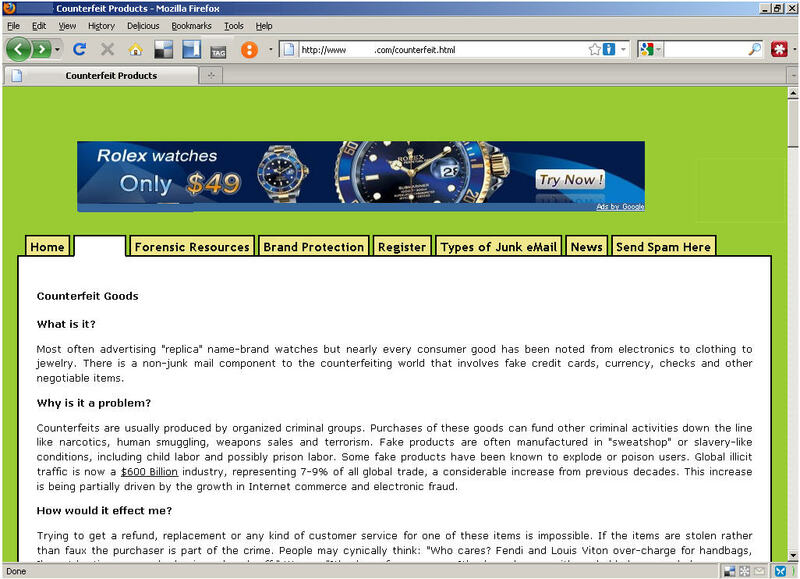 IP Investigator Caught Selling Fake Rolexes! I was exploring websites of other investigators the other day and located one whose site was offering fake Rolex watches for $49. Yes, that’s right. It is not likely that his intention was to break the law, but that he is missing basic knowledge of how web advertising works. When I first designed my own blog a few years back, the idea of adding a revenue stream to cheapen the credibility of my site with Google ads was a thought that crossed my mind. Then it kept walking. Google ads are placed on a site based on the keyword content. Therefore any site that is part of the Google ad program that discusses counterfeit goods will have advertisements for counterfeit goods placed on it. It is not rocket science. I am just surprised to see someone in my line of work doing this. I am not naming the investigator, as my purpose is to bring awareness to the danger of using Google ads on any site fighting the sale of fakes. Likewise, his knowledge of the online space is probably not worth the paper on which his business card is printed. Don’t be this guy. So I was at a political event in Downtown Dallas tonight and talked with a number of friends and acquaintances. I also met a few new people namely some folks from the defense arena. Not my favorite people but the man I support for D.A. invited me, oh, and there was free barbecue. I cocked my usual one-eyebrowed grin and gave her my best “are-you-really-this-much-of-a-dingbat?” look and excused myself to the bar. Those of you who know me personally know I am not one to feign respect. I shudder at the thought of the ignorance of some folks. This is one reason I have become politically active in the Dallas area, particularly Collin County, which is the most affluent county in the United States and a hub for worldwide corporations. I am supporting judges’ candidacies whom I know to be educated on IPR issues. One local candidate who impressed me, and I am supporting, is Dallas IP litigation attorney Wendy McMillon. I know many of our organizations focus on lobbying DC and State Capitals (which is great), but do not forget that these local posts are the bricks and mortar of our society. Fighting ignorance of IP theft starts at home. Read up on your candidates, meet them, interview them, and vote for the smart ones. Do it. Even only a year ago, spam primarily consisted only of unwanted email in your inbox. But now as blogs become more popular, services such as Google Reader make it easy for people to aggregate those blog feeds (commonly RSS and Atom) into your inboxes. Along with feeds/blogs to which you specifically subscribe, one can also subscribe to keywords and topics known as ‘tags’. Replica watch spammers constantly have to innovate ways to make it to your computer without getting caught in your spam filters. This is also a method some call ‘indirection’ which takes a web surfer to a page that acts as a placeholder prior to linking them to the actual website selling the goods. This is a method to evade security features built into most popular browsers. The image on the right is an example of what such an ad may look like. Folks, if there is money in selling replicas, bad guys are going to figure out a way to sell them. They key is staying one step ahead. The only way to do that is to hire a good team.